For quite some time, I’ve wanted to try to play through the first 3 games of Dragon Quest franchise, which has become one of my favorite (if not my very favorite) JRPG series. However, in order for me to embark on this journey, I needed to make a decision as to which platform to experience these early titles, as all 3 had originally been released for the NES and then re-released for both the SNES (in Japan) and the GameBoy Color. Me being the indecisive sort, I never quite got around to making a decision. Then I heard that this year marked the 25th anniversary of the release of Dragon Quest I. I knew the time had come for me to prove my manhood and complete them all… LIKE A BOSS! I ended up electing to play through the first two games by way of the Dragon Warrior I & II collection for the GameBoy Color—largely because the SNES version of the compilation never received an official state-side release and I didn’t care for the naming conventions the fan translation produced by RPGONE. It’s a pretty silly fault to find, but it was enough to make me consider a version with slightly less fidelity. When it came time to begin the third game, I took the time to review my decision to play the trilogy in its handheld incarnation. 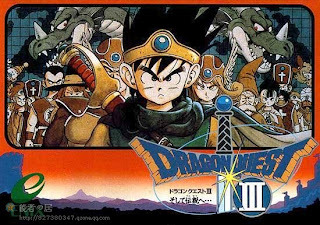 I found that the combination of work done by DQ Translations and the much-improved presentation practically begged me to reconsider the SNES remake of Dragon Quest III. And so I played it. Beginning to end. It was great. Visually, the SNES remake of Dragon Quest III is as much a step forward from the SNES remake of Dragon Quest I & II as DQ I & II is from its NES counterparts. The color pallet in the game is less reliant on the pastel colors that made the first remake look like a game from the previous generation. The battle animations are a surprisingly detailed for a SNES game. I couldn't help but notice the care that was taken to make use of the SNES's audio and visual capabilities in lovingly refreshing a game that was already 8 years old. And for maximum enjoyment, try applying one of the pixel scaling filters included in your favorite SNES emulator (I find the hq4x filter to be the best). The game will look and sound every bit as beautiful as you’d have fondly remembered from an alternate reality where ENIX of America had released this in America rather than going out of business in 1993. Presentation aside, Dragon Quest III is a strong culmination for the trilogy in both mechanical and narrative execution. Remember way back when I claimed that Dragon Quest IX was the first game in the franchise to feature a class system? I couldn’t have been more incorrect (read more ignorant statements concerning the otherwise amazing DQIX here). Dragon Quest III is truly the first in the series to introduce a relatively straightforward class system. It also features a personality system that is far less translucent. I’m not sure if the game ever made it clear that each character’s personality informs how their skills increase as they level up. As far as the story is concerned, Dragon Quest III presents a rather standard fantasy role-playing scenario. Although, the plot is nowhere near as involved and melodramatic as the late-era SNES RPGs that the remake was released out alongside, the classic DQ charm goes a long way in propping this game up alongside its contemporaries. You take on the role of the son of a warrior named Ortega, who has was lost after he attempted to kill Baramos (the most evil of evil enemies). When your 16th birthday rolls around, the King asks you to follow in your father’s footsteps—minus the part where the hero dies without successfully defeating Lord of Evil. Even though its structure is similar to that of its predecessors, Dragon Quest III feels a little more directed, while still managing to appear as deceptively non-linear as the first Dragon Quest games. He doesn't look so evil to me. JAZZ HANDS! Dragon Quest III’s sense of direction renders the game much more accessible than the first two games in the series in spite of the fact that the addition mechanical systems of this game give it a slightly steeper learning curve. And that’s not even taking into account the fact that Dragon Quest III is probably a little more difficult than the rest of the trilogy. There’s so much to enjoy about this game—which makes subtle steps forward in nearly every regard from its ancestors—that it easily warrants attention.